The kit is Dragon’s premium kit. I like Dragon’s premium kits as they often offer older kit, which (such as this one) is quite good by itself, but they also include number of photoetch parts to replace some of the older molded-on details. This is usually more difficult with the new Smart kits, which though have much higher quality of molding, but unlike premium kits they don’t include parts without molded-on details (e.g. tool clamps). In this case I added number of Aber phototech parts from my spares box (leftovers from a Panther Ausf.A project, which I have never finished, I guess because attempted long time ago, my skills were not up to it at that time) to the base kit. I have built rear storage baskets from photoetch, as I wanted to add some minor battle damage and for this photoetch parts are more suitable. I replaced side skirts holders with photoetch parts, though I believe that anyone who would want to follow full construction as per the Aber instructions must be slightly masochistic, so I have definitely simplified mounting of the brackets to the hull. The rest of the construction of the model was quite uneventful as no major problems were encountered. I added wiring for the smoke grenade launchers on the side of the turret. This was made from fine brass wire and styrene rods. In addition to photoetch parts, I have also used few other small aftermarket pieces – Mig resin stowage boxes, Eureka XXL ow cables and Orange hobby antenna. The kit depicts one of the first Panthers to see combat. I used Echelon set for markings to show vehicle of the 7th Company, 52nd Panther battalion during the battle of Kursk (Set AXT 351009, which seems to be out of production now). I used Micro Sol and Micro Set solutions for applying the decals and was very impressed with the way these adjusted to the surface. The markings went right over the pistol ports on the turret sides, so I had some concern how the markings will look, but the result was impressive. 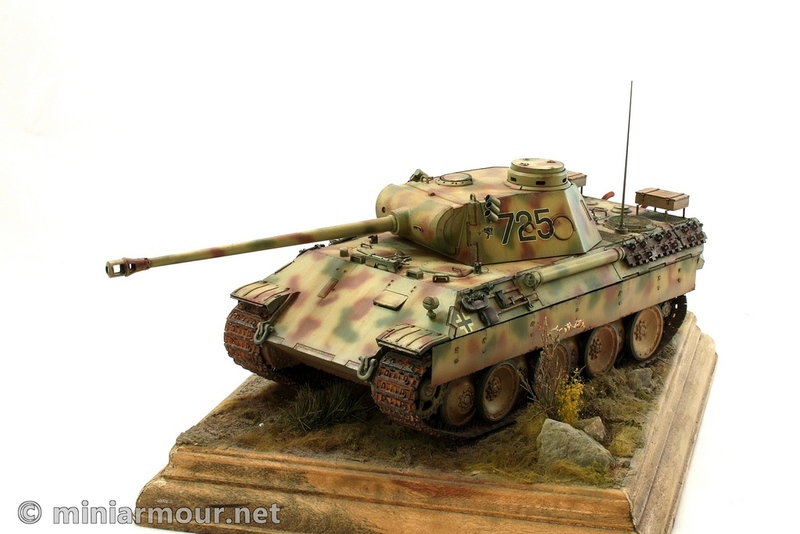 Since Kursk was the first action of the Panthers and most of them would see only very little battle damage before breaking down (this happened to most of them, many of the Panthers actually arrived by rail during the night before the start of the attack) or being destroyed, I kept weathering limited. The base was kindly lent by my friend Dave Brown from Hornet Hobbies, where he used it for the kit display. As usual – comments are welcome.